When Mackenzie King won power back from R.B. Bennett at the height of the depression, he created the Rowell-Sirois Commission to tour the country and report on the economic basis of Confederation and the distribution of legislative powers between the provinces and the federal government. The depression had been too much for the provinces to contend with. Welfare payments to the unemployed had been possible only with handouts from the federal government. Former Prime Minister R.B. Bennett had tried to bring in a new deal that included unemployment insurance, health insurance, minimum wages and maximum working hours, but his efforts were blocked by the Privy Council in England. They ruled that these measures were provincial matters as outlined in the BNA Act and couldn't be taken over by the federal government without provincial approval. 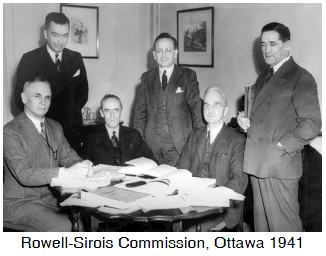 After three years of hearings, the Rowell-Sirois Report was presented in 1940, during the darkest hours of World War II. It has been called a blueprint for centralization. A federal-provincial conference in 1941 failed to agree with its recommendations, however, so King decided to send individual letters to each province persuading them to participate in such federal programmes as unemployment insurance, at least for the duration of the war. After securing their agreement he had the Privy Council add these to the enumerated powers of the federal government. War-devastated England found it hard to turn down the requests of this, its staunchest ally. 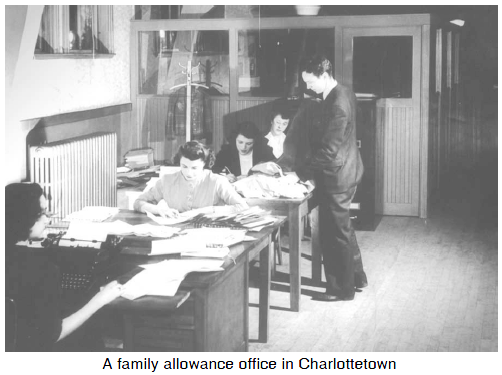 In 1944 King introduced the family allowance which put a cheque each month into the hands of mothers with young children. At the first federal-provincial conference after the war, the strong provinces, Quebec, Ontario and Alberta, challenged these centralizing measures of the government. The weaker provinces supported the federal government. King again approached the provinces individually and signed them to separate five-year agreements. With the federal government's powers thus increased, the national social policies which we take for granted today were gradually introduced: old age security in 1951, help for the blind and disabled also in 1951, hospital insurance in 1958, the Canada Pension Plan in 1965, and medicare countrywide in 1968.